I’d like to, but I don’t buy the implication that this attitude is a major independent driver of patronage growth. My interpretation is that there’s a cluster of people who have green attitudes and not surprisingly also have a positive attitude to public transport. But I don’t think they’d use public transport in significantly greater numbers if it took longer or was more expensive than the alternatives. They’d use public transport for the same reasons most people do – because for some trips it’s cheaper and/or faster than the alternatives. I know there’s been growing demand for solar PV cells and water tanks which might be taken as corroborating evidence of a purely green motivation. But buyers of these are still a very small proportion of the population (nothing like 19 %!) and in any event it’s not an ‘apples v apples’ comparison. PV solar is heavily subsidised and financially attractive – feed-in tariffs have been very generous. Water tanks provide a tangible benefit – access to water to save a valuable garden in the event of severe water restrictions. These are seemingly rational responses made on the information available at the time. What we’re seeing with the Lifestylers, I think, is a simple correlation between positive environmental/lifestyle views on the one hand and a positive view of public transport on the other. It’s not telling us anything about causation. If nearly a fifth of Melburnians really were motivated to use public transport primarily for ethical reasons, I’d also expect to see big changes in air travel, given it has a very large negative environmental impact – a lot more people holidaying in, say, Leeton rather than London, or Portsea rather than Paris (or Port Douglas). I’d also expect to see cycling account for more than 1% of trips. 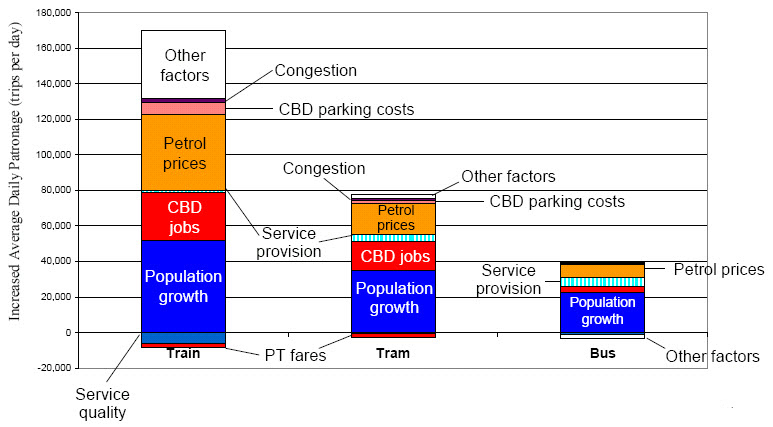 And I’d wonder why the attitudinal effect only applies to trains and not trams. I don’t know what really does account for the unexplained part of rail travel shown in the exhibit, but I’d be looking first at the elasticity assumptions underlying the variables used in the model. I’d look very closely at why traffic congestion shows up as having such a small effect and I’d want to know if the population growth assumptions adequately account for the mode preferences of overseas students. Most of all I’d look closely at the survey methodology including the level of confidence I’d have in the telephone survey. I don’t mean to disparage DoT’s research effort – which seems quite sophisticated – I just disagree with the interpretation in this particular case. I do think however that DoT needs to give adequate resources to research, as it underpins billions of dollars in capital investment and operating benefits (or disbenefits!). Rather than spending a few million on research projects, the department should be thinking in terms of whatever’s necessary to get it right up front. (As an aside, I don’t think “improving health & fitness” is an attitude — in my book it’s a tangible benefit, just like, for example, cheaper fares).